MILPITAS, CA--(Marketwire - September 21, 2010) - Aryaka Networks (www.aryaka.com), provider of the world's first cloud-based application acceleration and WAN optimization solution, today announced it has officially launched the Aryaka™ platform. Aryaka's solution enables enterprises to deploy WAN optimization in a matter of minutes and with no capital expenditures. Unlike traditional appliance-based or managed-service models that often take months to test and implement, Aryaka democratizes the world of application acceleration and WAN optimization by offering exemplary performance at a significantly lower cost. Aryaka delivers a guaranteed 99.999% network uptime as enterprises scale to accommodate new applications, users, and locations across the globe. In addition, the company announced that it has raised $14 million, including Series A funding from Trinity Ventures, Mohr Davidow Ventures, Nexus Venture Partners and Stanford University. "Aryaka's approach is unique and has a chance to be a truly disruptive force in the market today," said Bojan Simic, principal analyst with TRAC Research. "Aryaka is taking what has traditionally been a hardware play and turning it into a service, and, on top of that, they're providing the connectivity -- all in a single solution. This approach gives organizations more flexibility in today's virtual and hybrid network environments, and it is easier to deploy and manage than the box-based model we're seeing at the core of the other major players' strategies. There has been a need and a market for this solution for many years, and Aryaka has addressed that need in the most comprehensive way." Aryaka's lead lies in the fact that its network operates with the advantages of a private cloud combined with the economics of a public cloud, thereby offering enterprises the unprecedented ability to overcome the inherent challenges of appliance-based solutions. The forward-thinking enterprise looking to leverage the cloud now has access to the key enabler -- the network -- in addition to computing and storage resources. Aryaka gives enterprises, for the first time, a high-performance, highly-available and scalable, application-aware network whenever and wherever they do business. "The application acceleration and WAN optimization markets are growing quickly, thanks to increasing globalization and 'applications everywhere' driven by mobility. There is an increasing demand for cloud-based solutions; services are faster and easier to deploy than equipment, and allow the avoidance of capital expenditure, important in today's economy," said Lydia Leong, research vice president for Gartner's Technology and Services Provider Group. For an organization spending $6,000 per month on dedicated connectivity for six locations across the globe, Aryaka would deliver cumulative benefits, over a period of three years, in excess of $1 million. This figure is calculated bearing in mind the network savings and productivity gains. This translates to a 567% ROI over three years. "We've evaluated many approaches to resolving application performance issues and found that the unpredictability of future costs, combined with the significant IT management burden, has made the hardware solution untenable," said Sarvesh Mahesh, CEO of Tavant Technologies. "In contrast, Aryaka's solution was quick and easy to deploy, and today is providing the performance we need across our multiple locations in the U.S. and India. Plus, the solution can scale as we expand." With the total addressable market for WAN Optimization rapidly growing and projected to reach $4.27 billion globally by 20141, this industry-first, cloud-based solution addresses the underserved needs of mid-sized enterprises and broadens the availability, affordability and adoption of this technology. The explosive demand for WAN optimization stems from the market demand for solutions that enable strategic IT initiatives, including real-time collaboration for higher-quality, unified communications; data center consolidation; server and storage centralization; and disaster recovery. Aryaka is the only true innovation in the WAN optimization market in the last five years that addresses the business requirements for high capacity and real-time optimization of all applications. Aryaka delivers performance guarantees, which removes a significant burden from already overworked IT departments that have been tasked to do more with less. Organizations retain full and comprehensive views of their network and management capabilities through a web-based "MyAryaka" portal with executive dashboards. The solution offers comprehensive real-time data and alerts on the mix of applications, geographic locations, and performance and availability criteria, integrated into a single management console accessible from anywhere, anytime. "Establishing connectivity and bandwidth among locations across the globe was a big challenge," said Ajit Gupta, founder and CEO of Aryaka Networks. "We saw that existing WAN optimization solutions did not adequately address the needs of most enterprises. Organizations were deluged with appliances and burdened by their inherent cost and complexity. We are offering a fundamental architectural and business-model shift in how application acceleration and WAN optimization should be delivered. We bring headquarters closer to their branches. Our goal is to enhance enterprise collaboration and delight our customers, one branch at a time. We want the world to think beyond the box." 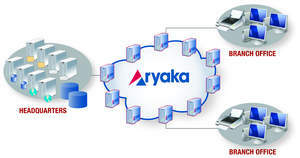 The Aryaka solution is priced based on the link size connecting to the network and the associated geography. The pay-as-you-go model requires no capex and includes 24x7x365 support and management. Founded in November 2008, Aryaka Networks, Inc. delivers cloud-based application acceleration and WAN optimization with true business results. Headquartered in Milpitas, California, with offices in Bangalore, India, Aryaka is funded by Trinity Ventures, Mohr Davidow Ventures, Nexus Venture Partners and Stanford University. Key advantages of the Aryaka solution include a secure, scalable and reliable application acceleration and WAN optimization platform as a service, rapid deployment, ease of integration, complete visibility and a significantly lower total cost of ownership. For more information, visit www.aryaka.com. Aryaka is a trademark of Aryaka Networks, Inc. All other brands, products or service names are or may be trademarks or service marks of their respective owners.